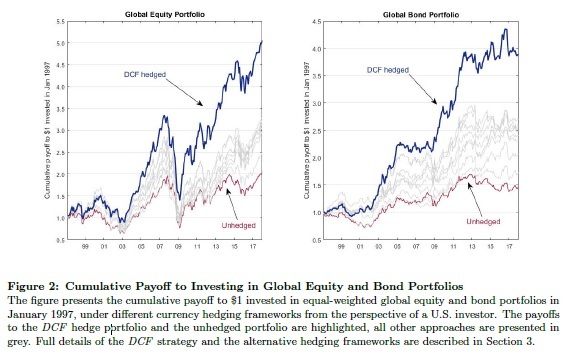 We propose a novel method for dynamically hedging foreign exchange exposure in international equity and bond portfolios. The method exploits time-series predictability in currency returns that we find emerges from a forecastable component in currency factor returns. The hedging strategy outperforms leading alternative approaches out-of-sample across a large set of performance metrics. Moreover, we find that exploiting the predictability of currency returns via an independent currency portfolio delivers a high risk-adjusted return and provides superior diversification gains to global equity and bond investors relative to currency carry, value, and momentum investment strategies. ers from acute estimation error in currency return forecasts, which leads to poor hedging performance. In this paper we devise a novel method for dynamically hedging FX exposure using mean-variance optimization, in which we predict currency returns using common currency risk factors. nance have documented that the cross-section of currency returns can be explained as compensation for risk, in a linear two-factor model that includes dollar and carry currency factors. The dollar factor corresponds to the average return of a portfolio of currencies against the U.S. dollar, while the carry factor corresponds to the returns on the currency carry trade. We take the perspective of a mean-variance U.S. investor who can invest in a portfolio of `G10' developed economies. We adopt the standard assumption that the investor has a predetermined long position in either foreign equities or bonds and desires to optimally manage the FX exposure using forward contracts. We form estimates of currency returns using a conditional version of the two-factor model where both factor returns and factor betas are time-varying. fic, hedge positions. We update the positions monthly and refer to the approach as Dynamic Currency Factor (DCF) hedging. to a $1 investment in international equity and bond portfolios in January 1997. When adopting DCF hedging, the $1 investment grows to over $5 by July 2017 for the global equity portfolio, and to almost $4 for the global bond portfolio. These values contrast with $2 and $1.5, which a U.S. investor would have obtained, if the FX exposure in the equity or bond portfolios was left unhedged."